In sleepy rural North Shropshire, a battle is being played out which represents the cutting edge of resistance to the growing insanity of this government's energy policy. As part of the EU's plan to generate 20 percent of the UK's electricity using renewables, seven giant 340 ft, 2MW wind turbines are being planned on a remote corner of the district, known as Lower Farm, Bearstone, attracting objections from 2,333 residents and businesses, six Parish Councils, two MPs and the neighbouring Borough Council. 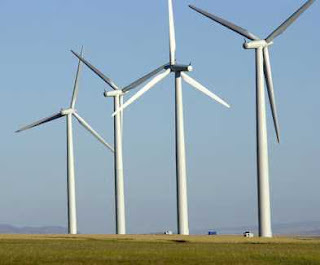 Yet, despite only five letters in support of the wind turbines, being developed on behalf of Nuon Electricity, the local planning officer has recommended its approval, citing the over-riding need to meet national quotas for renewable energy. What is particularly shocking about the whole affair, however, is that the local plan permits approval of developments only if they "make a positive contribution to the economic health of the community" yet, through the good offices of local MP Owen Paterson, it has emerged that this is anything but the case. Not only will the local residents have to pay top dollar for the electricity produced, through the government's incentive scheme to encourage building wind farms – known as the Renewable Obligations Certificate – they will have to pay twice over. The total sum amounts to a colossal £43 million over the life of the project. This is worked out of the basis of ROCs being paid out at the rate of £53 per MWh of electricity produced, which is added to consumers' electricity bills. The turbines will produce an estimated 32,377 MWh a year, producing a subsidy of £1,715,981 for each of the 25 years the permission to operate lasts, totalling just under the £43 million. Why this should be a wake-up call for the rest of the nation is that this illustrates the huge scale of the hidden incentives involved. Energy companies are not so much building wind as subsidy farms, such is the bonanza to be grabbed. By 2020, the government hopes to have 25 GW capacity in offshore wind farms – attracting 1.5 times the standard ROC, on top of 14 GW of onshore capacity. With ROCs paid out at a rate of £53 per MWh, the total annual sum for British electricity consumers will amount to a staggering £6 billion – a total of £155 billion paid to wind subsidy farmers over the expected life-times of the projects (equivalant to the cost of building over 50 nuclear power plants). Given that the entire electricity market at 2008 prices is somewhat less that £24 billion, the effect of reaching the EU's target on wind energy would be equivalent to adding 25 percent or more to the price of domestic electricity – on top of which consumers will also have to fund the building of power stations to produce electricity when the wind is not blowing, as well as an estimated £10 billion for extensions to the National Grid to enable the turbines to be connected. Few people at the moment realise quite what is at stake, as the ROC "contribution" is not identified on consumer bills and is currently less than £400 million a year. But, as each mast is erected to disfigure the countryside, the costs will ratchet up until we are all paying this incredible sum of £6 billion a year for the privilege. And, such is the grip of the greenie monster that is driving this insanity, even when people have expressed a clear rejection of a development, the officials plan to go ahead regardless. And to think we once lived in a democracy. When is science no longer science?